For more than a century, Angkor Wat has been beyond any reasonable doubt equated with the quintessence of Cambodian culture. In September 1862, when Cambodia was not yet under the French protectorate rule, Admiral Bonnard went to Udong at that time King Norodom I’s capital and then to Siem Reap. This was the first time that a high ranking French official wrote a report on the famous ruins that we now know as Angkor. Bonnard wrote: “Legend, history and religion of this vanished people are here, showed to the eyes of the skeptic who won’t be able anymore to deny that today’s poverty-stricken Cambodia could once and can still feed a great artistic and industrious people”. What has to be remembered from Bonnard’s words are: the vanished people, the poverty-stricken Cambodia and the great artistic people. The next coming Angkorian adventure was already in embryo. At that time, as France intended to extend its influence in the region far beyond its small Cochinchina colony, the Protectorate regime (1863 – 1953) over Cambodia was soon going to be a reality. A few months later, it was Admiral de la Grandière’s turn to come to Siem Reap. Admiral de la Grandière was the military Governor of Cochinchina (the first French colony in the Far East). That was the opportunity used to first officialize the “great ruins.” It has to be noted that the Angkor temples were still at that time on Siamese territory and were only going to be retro-ceded to Cambodia in 1907. De La Grandière quietly visited the ruins as if they were part of Cambodian territory. Anecdotally, the French journalist from the newspaper Le Courrier de Saigon made confusion in understanding “mines” instead of “ruins”(the 2 words rhyme in French). A biting answer was to come from a Singapore English language newspaper which worried about the French ambitions in such a rich region. This was all the more surprising since there never were any mineral mines in the region! In any case the pitch was given once for all. After the 15th century in Cambodia, if Angkor was considered by the Khmers living in its neighborhood as an important religious site, it was certainly not viewed as a symbol of national pride. Almost immediately after the establishment of the protectorate regime (1863 – 1953), Angkor was to epitomize the official vision of Cambodian history as stated, for example, by Penny Edwards, “Angkor was remade as both the embodiment of Khmer national essence and an irretrievable, unachievable, and impossible moment of cultural perfection”. For the French protectorate, what was at stake was no less than providing the Kingdom of Cambodia with a new ideological structure of which Angkor Wat would be the key element. From then on, Cambodian history would have to consist of a two-part narrative: past glory and present decay: Angkor Wat as the symbol of greatness par excellence and decadence. The French Protectorate for its part was only too eager in volunteering to help Cambodia recover its ancient greatness. Without oversimplifying, the deal may be expressed in the following way: Angkor Wat is the proof Cambodia had a once glorious history followed by a terrible decline. The French Protectorate was there to help Cambodians recover their past glory. The proof may be seen in the fact that France rediscovered Angkor Wat and was restoring it. Everything was planned and not even the smallest detail was neglected. For instance the “discoverer” of Angkor was in reality father Bouillevaux around 1850, at least 10 years before Henri Mouhot. Bouillevaux even published about Angkor in 1858 his “Voyage dans l’indochine 1848 – 1856”. Unfortunately, Father Bouillevaux was not such an exciting writer and his writing did not come easy. Bouillevaux was invited by the French Superior Resident and was politely but firmly asked to forget his “discovery”. From then on, Angkor would officially have been discovered by Mouhot. And it worked beyond all expectations. For more than a century, Angkor Wat has been beyond any reasonable doubt equated with the quintessence of Cambodian culture. All the Cambodian regimes that followed independence from France in 1953 tried hard to defined adequate stylized representations of Angkor Wat on their various flags, not to mention the Khmer Rouge who went even further by mentioning Angkor Wat in their national Anthem. The same way colonial ideology depicted Cambodian history was adopted by Khmer nationalist scholars of the Buddhist Institute and the newspaper Nagaravatta in the 1930s without the slightest hesitation and this common representation of Cambodia in greatness and decline still plays the part of a prerequisite to any discussion about Cambodian history to this day. The chronology of Cambodian history itself is more a chrono-ideology with a pivotal role offered to Angkor. Thus we have a history-writing syndrome in which Angkor is seen in its relation to pre-Angkor and post-Angkor. The result is often comical: in many books, the pre and post Angkorian periods consist of only a few pages, while the core of the book is of course about Angkor. An example taken at random comes from the book “Les Khmers” (The Khmers) by Bruno Dagens. “Les Khmers” is in fact an interesting and well documented introduction to Angkor, but not to the Khmer people. As we close the book we wonder if there were Khmers before and after Angkor. Cambodian people need history; they don’t need to hear that they belong to a people who were once great, but by a strange law of nature, were afterwards reduced to decadence. This tendency to reduce Cambodian history to a series of Angkorian certainties really weakens not only Cambodian history, but also its teaching and the lessons which could be learnt from it. As an ethnic group, the Khmers didn’t wait for Angkor to exist, but they are amongst the first inhabitants of the Southeast Asian Peninsula. 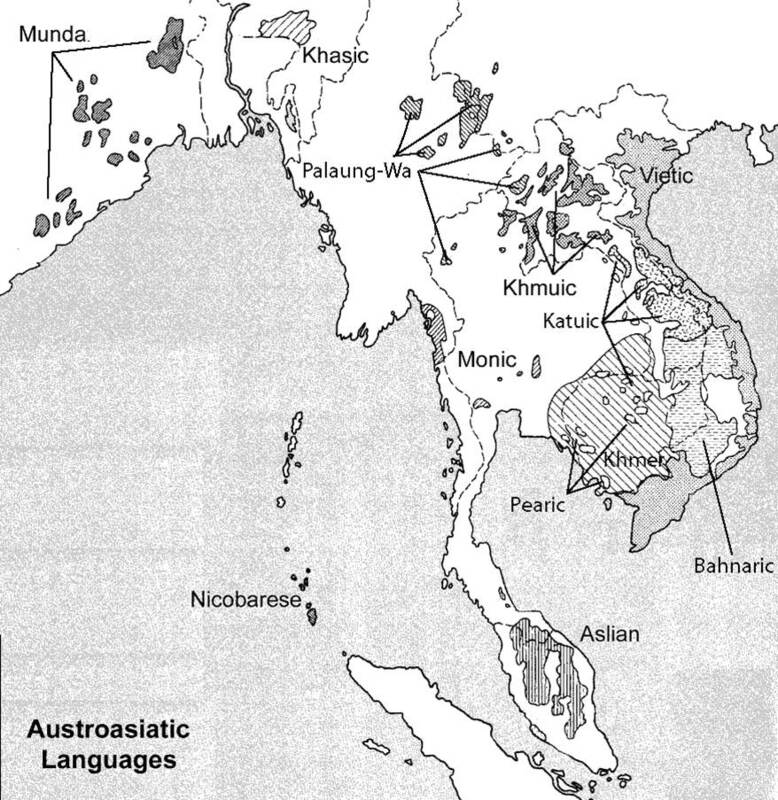 If we analyze the current ethno-linguistic map of Peninsular South East Asia, we can notice one essential fact: the various languages pertaining to the Austro Asiatic linguistic group, of which Khmer is a major member, display a compact distribution from South Yunnan to Central Malaysia and from Eastern India to the South China Sea. On the other side the presence of the other ethno linguistic components in the area can be dated to around the 8th century BC for the Cham and around the 10th century AD for the Thai. The data indicates that the Khmer were amongst the first to be here. To this fact should be added another one. The Khmer language exerted an incredible influence on the neighboring languages. For instance, according to Professor Varasarin a considerable part of the modern Thai lexicon comes from Khmer. She could extract more than 2,500 words and classify them into 200 semantic categories. It shows that almost all the fields of the Thai lexicon were influenced by Khmer language. Other more distant languages are also stuffed with Khmer words, amongst others Nyah Kur, a Mon language spoken in what is today Central Eastern Thailand. Another example is Thavung, an Austro Asiatic language spoken in Northeast Laos. A language doesn’t borrow words for the mere sake of borrowing them, but techniques were borrowed along with the words and this mere fact reveals the influence Khmer civilization exerted in the peninsula. Even the question of the language spoken in the Kingdom of Funan (1st – 7th century AD) or the very nature of that civilization is but too obvious. This is a part of Khmer national heritage that should not be overlooked at a time when history has been mobilized in the region to back the most questionable thesis. Angkor is but one moment of the Khmer civilization. To be convinced of it, you just need to indulge yourself with a little visit of the National Museum in Phnom Penh. The building itself is not entirely Angkorian. Georges Groslier, who completed it in 1920 based its architecture on the combination of two stylistic conceptions: the base is definitely Angkorian, that is heaviness, square columns, whereas the top intended to make use of Buddhist motives, just like the ones we can find on the roof of any Theravada Buddhist pagodas. The result is astonishing as this pagoda-style roof lightens the whole structure and provides it with the impression of floating. The museum was built to shelter the innumerable objects of art because Cambodia is by far the most important archeological site of the region. These objects of art were found continuously almost everywhere in the country. But the decision to build the National Museum was finally taken after the March, 1907 treaty when Siam retro-ceded Siem Reap Province with all the Angkor temples, to Cambodia. Most of the visitors, Khmer or foreigners know Angkor and are, for the most part, prone to associate Khmer civilization with Angkor. However, you get a big surprise when you realize that the differences between the statues that were carved before and after 802 AD. 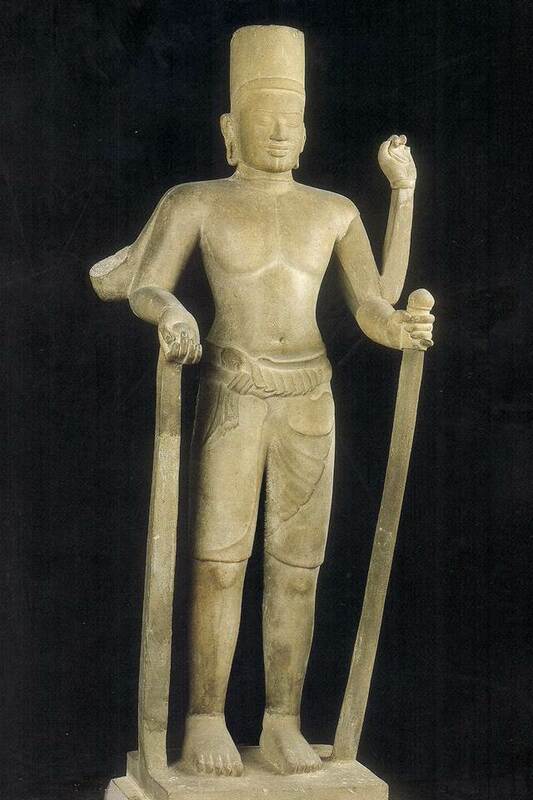 Statues in Phnom Da from the second half of the sixth century and those of Isanapura, also known as Sambor Prey Kuk, 615 – 635 stand in stark contrast with the first statues of Vishnu sculpted after the capital had been transferred to the Angkor region by King Jayavarman II in 802 AD. This stands in contrast with what happens to Khmer statues by the beginning of the 9th century. The swaying is henceforth a mere formal feature reduced to the hips and no longer contributes to the general structure of the statue. 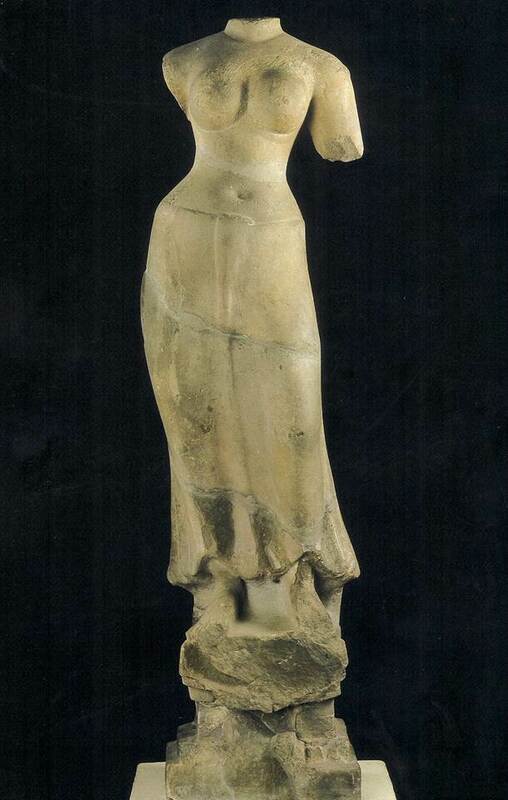 These statues are characterized by stiffness: no more anatomical precision, no more motion. Ironically, Western art followed just the opposite path: from hieratic stiffness to the expression of life and motion. 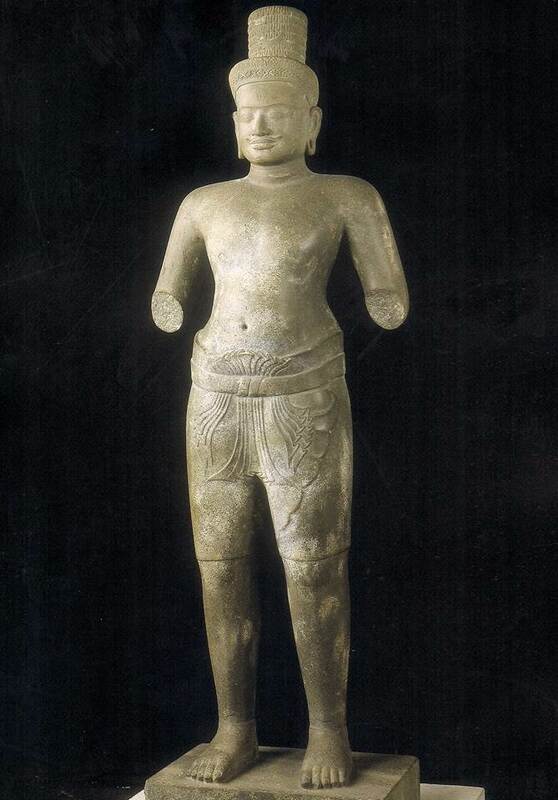 The reasons for these considerable variations in time are numerous: the fact has been often evoked that the statuary is the most politically sensitive part of Khmer art. The carving of stiffer statues often corresponds with a political tendency to centralize power. The problem does not lie in what should be preferred; it is a mere question of taste and there is no universally acknowledged objective way of analyzing artistic quality. 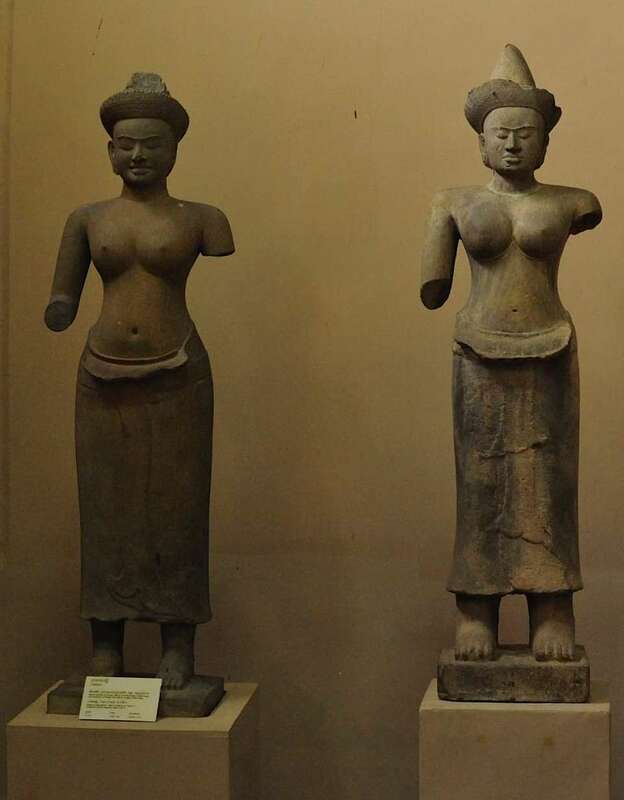 The problem lies elsewhere: more than two centuries before the capital settled in the Angkor region, the artists of two Cambodian kingdoms, in the South and in the Northwest, were able to give birth to statues of an almost unrivaled quality in Southeast Asia. Again and again, it appears that there is more than one door leading to Khmer civilization. In a somewhat popular approach to Khmer history, the term unity has acquired a considerable importance as the Angkorian period is very often presented by Khmer people as the time of unity par excellence. That time is very seriously seen as a kind of lost paradise yet untarnished by personal rivalries, where the common good was supposed to prevail over the tyranny of individual ambitions. Every culture generates its own mythology and, as we all know, the myths are always hard to die. Instead of talking of unity between people, we may seriously question the accuracy of the unity of the so called Angkorian period. Angkorian time or Angkorian Empire is a general term used to talk about the period between 802 AD, the time Jayavarman II settled his capital in the Angkor region, and 1431, the time when the kingdom was invaded by the Siamese army and the king Ponhea Yat fled westward to settle his new capital. During this period of more than six centuries there were as many changes as there were between the so called Angkorian period and the pre 802 or post 1431 periods. The only expression of unity pertained to geography: the Angkor region where the capitals stood during this period. This assertion can even be further challenged if we consider that Koh Ker, Jayavarman IV’s capital from 930 to 944 AD, was located at more than 80 miles from the current town of Siem Reap. It is for instance impossible to reduce to unity the remarkable diversity of styles in the Angkor region: let’s think that in the 10th century, only 23 years separate the gigantism of Koh Ker pyramid from the intimacy of Banteay Srey. One big problem is about the reign of Jayavarman VII. This king has an uncommon proclivity to controversy. One of his best known statues represents a bare forehead, a broad and opened face with the eyes reduced to the line of the eyelids: an overall equilibrium and harmony which suggest quietness and inner joy. That would make us easily forget that Jayavarman VII was one of the most formidable conquerors and that under his reign the Khmer Empire reached its greatest dimensions. An essential event occurred in 1177. The Cham fleet sailed up the Mekong River, the Tonle Sap and the Siem Reap River, the Cham troops landed, attacked and plundered Angkor. The reaction was very quick. 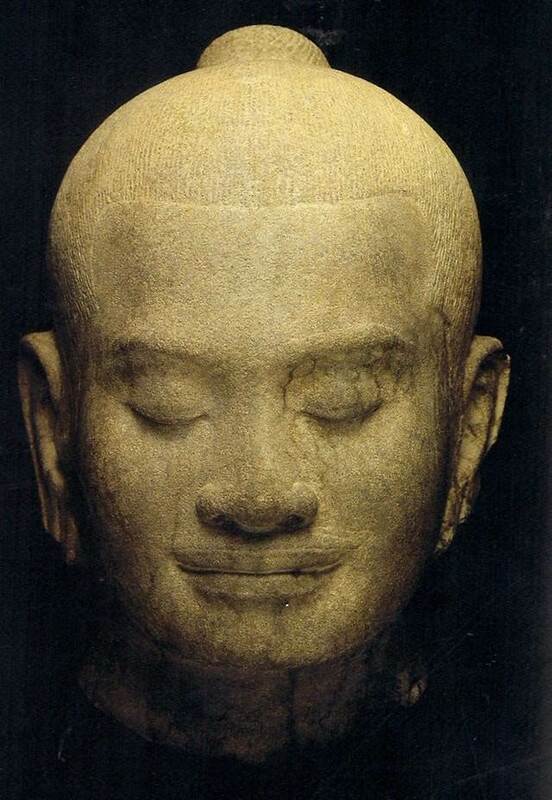 The future Jayavarman VII counter-attacked, defeated the Cham invaders and was crowned as king in 1181. From the time he was crowned, Mahayana Buddhism became the official religion of the Khmer Empire. Beside the numerous statues of the Buddha meditating on the Naga, at the same time statues of the former Hindu gods were erected. Thus, with the shift from Hinduism to Buddhism, the axis of the world was no longer Angkor Wat but had also shifted to Bayon. This has to be explained and we had no difficulty to find a version of the standard explanation in M. Giteau’s “Histoire d’Angkor”: “By seizing Angkor, the Cham had brought the proof that the town was not invulnerable, even if it was an earthly representation of the divine world. There was therefore a necessity to find a superior protection”. Such a consideration preserves the thesis of unity: well it went wrong, so let’s find another religion which could act as a better shelter and let’s go on. The reality is certainly something else. On the one side, if Hinduism had been till then the official religion of the empire, there are many doubts to express about its ascendancy on the people because it had no real clergy. Everything indicates that the people’s religion had for many years been Mahayana Buddhism. Moreover, at the end of the 12th century, the population of Angkor is estimated to have reached a million and such a concentration of people presupposes the emergence of various social needs the Hindu religion would have certainly not been able to fulfill. In any case, it is difficult to keep the thesis of unity between a power system and the people. The most fascinating thing is that numerous authors couldn’t and still can’t admit that a totally new conception was at work. It is incredible to read what Maurice Glaize wrote about the Bayon: “The Bayon is the only temple to have two concentric galleries sculpted with bas-reliefs; the internal gallery is complete in its ornamentation and was almost exclusively reserved for mythological subjects of Brahmanic inspiration, while the outer gallery, accessible to the mass of the faithful, was dedicated both to scenes of everyday life and to certain historic episodes processions and battles – from the reign of Jayavarman VII”. We would be very pleased to know where exactly are the “mythological subjects of Brahmanic inspiration.” Glaize, and he is far from being alone, acts as if it was impossible to escape from the hypnotic power of Angkor Wat Hinduism. The most comprehensive and fascinating survey of the internal gallery of the Bayon has been realized by Ms Phalika Ngin and is available on her website www,phalikan.com or will be soon available in her book: “The Ancient Secrets of the Royal Triad Decoded”. 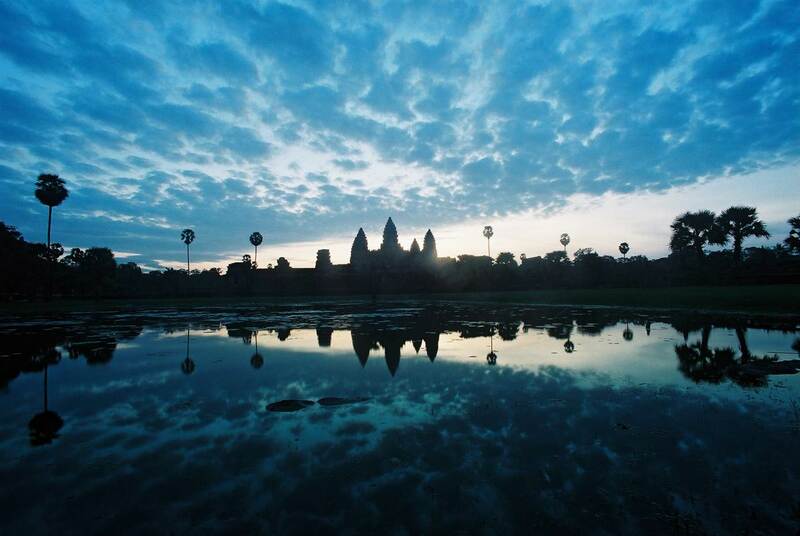 Angkor Wat is an architectural masterpiece of harmony and the biggest Hindu temple in the world, India included. On the other side, between the Indian iconography and the Khmer artist’s chisel there is a considerable distance which may explain that even in the earliest statues, the representation of Vishnu’s or Shiva’s face is very remote from the Indian codes. The question of religion is equally important. 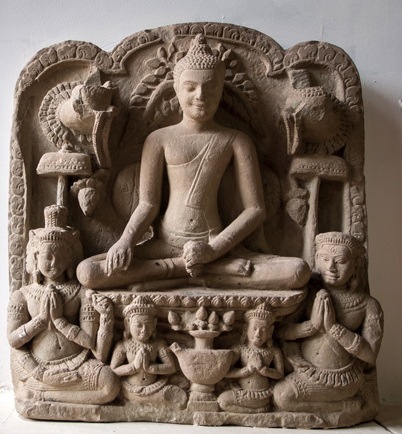 Khmer civilization is the only one in peninsular Southeast Asia to have sequentially experienced Hinduism, Mahayana and Theravada Buddhism as state religions and to have integrated them in a more popular religious approach. This leads us to an essential consideration: Khmer civilization is not transcended by Angkor in general or Angkor Wat in particular. On the contrary, Angkor is but one moment of this cultural adventure which existed before 802 and did not stop existing in 1431. It would be high time to construct a Cambodian history which would pay homage to the extraordinary richness and diversity of the Khmer land.